and gives the Democratic Congress equal time. 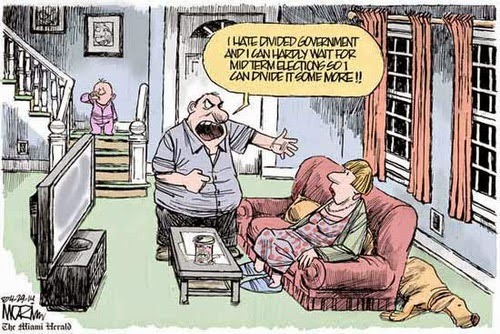 Most of the DWSUWF “divided government” posts since last year's mid-term election have focused on the need to elect a Republican president to maintain divided government into 2009 (examples here, here, here, and here). The reason is simple. Due to structural elements in the 2008 Senatorial contest, Republican resignations, and the continuing political unpopularity of the President, an expanded Democratic majority in the Senate is a foregone conclusion and a Democratic super-majority in the Senate (60 votes) is within reach. A Democratic majority in the House of Representative is also certain to continue and will probably increase. 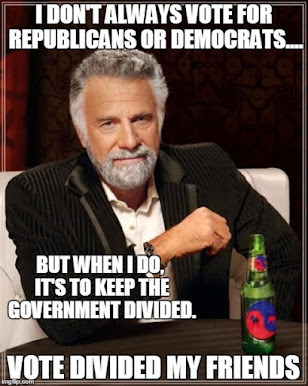 DWSUWF has focused on the presidential race specifically because electing a Republican president is the only path to re-electing a divided government state and continuing to enjoy the benefits of divided government into 2009. As a result of this single minded focus on the 2008 presidential election DWSUWF has short changed the other side of the divided government coin - our Democratic Congress. I will attempt to address that oversight now. Not coincidently, the President has been ratcheting up his rhetoric with a Congress-bashing offensive “surge”. Oddly enough, while both the Executive and Legislative approval ratings are pathetic, Congressional approval ratings have increased more than the Presidents during this Federal branch steel cage match. The President's Oct 30 White House remarks may explain why the administrations partisan political surge has been less than effective. “President George W. Bush lashed out at Congress Tuesday, the third time he has done so in two weeks... Its failure to send a single annual appropriations bill to his desk, he said, amounted to "the worst record for a Congress in 20 years ... We're near the end of the year, and there really isn't much to show for it. The House of Representatives has wasted valuable time on a constant stream of investigations, and the Senate has wasted valuable time on an endless series of failed votes to pull our troops out of Iraq... This is not what congressional leaders promised when they took control of Congress earlier this year." So - the President is complaining that spending increases have been contained due to congressional inaction, while congressional action has focused on a means to end the Iraq war and aggressive oversight of an administration guilty of criminal activity at the highest levels (Remember Scooter? Commuting an “excessive” sentence does not make Libby any less guilty or any less criminal. Criminal Obstruction of Justice was proven beyond a reasonable doubt in the office of the Vice President.) As a consequence of the “time wasting investigations” other potentially illegal activities and extra-constitutional overreach of surveillance authority have been exposed and admitted in the F.B.I, Justice Department, and N.S.A, some engaging major telecom corporations as co-conspirators. Excuse me, Mr. President, but that is exactly what congressional leaders promised at the beginning of the year. Moreover, that is exactly what DWSUWF hoped for when we advocated voting for a Democratic Congress and a divided government one year ago. Call me contrary, but include me in that 25% that think this Congress is doing a good job, even a great job. Sure, much of the good stuff in Congress is happening in spite of themselves, and purely as an artifact of gridlock and divided government. What do I care? I love this Congress. In praise of my congressional representative. “One year ago, the American people entrusted their hopes and their dreams, their aspirations for themselves, for their families, and for the future in this New Direction Congress. We come here today with great confidence and pride in what we have achieved and what remains for us to be done. 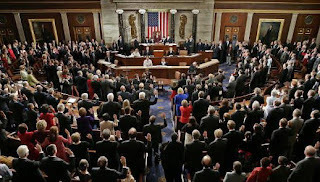 I am proud to stand before the majority House Democratic Caucus and salute them, from our chairmen to our newest members, for their great leadership on behalf of the American people... We have begun to restore accountability by making this the most honest, open, and accountable Congress in history. We are holding the Bush Administration accountable for its failed policies in Iraq. Because our first responsibility is to make America safer, we will never stop fighting for a New Direction in Iraq. A direction that strengthens our military, refocuses on the real war on terrorism, and brings greater stability to the region. Every day we will work hard to bring our troops home safely, honorably and soon. With faith in the future, the New Direction Congress will continue to make progress for America’s children. With faith in God, I know that we will succeed. Thank you." I'm good with that. Did we get everything we expected from this Congress over the last 11 months? Far from it. Nancy understands that, and understands that Iraq is the single biggest source of American frustration with Congress and the reason for their low approval rating. How could it be otherwise when 70% of Americans understand that the Iraq adventure was/is a mistake? Yes, Nancy understands it, even if Tom Foreman distorts her statement with misleading editing on CNN. Republicans tried to hold on to their majority House in 2006 by invoking the specter of Nancy Pelosi, Speaker of the House as no less terrifying than a Balrog in the mines of Moria. But now, the best they can up with is stuff like this. In the meantime, on the other side of the aisle, the Democrats are so happy with Nancy Pelosi that they just can't say enough about her. Republicans must just love watching the Democrats eat their own. Cindy Sheehan is even mounting an independent bid for her congressional seat. No matter, Nancy Pelosi is wildly popular with her constituents, like me. Anyone who can piss off the activists of both parties, hold her leadership role, show real results in Congress, while continuing to fight the good fight on Iraq is doing something right. Leadership is not a popularity contest. Nancy Pelosi is providing real leadership for the loyal opposition in a divided government that accurately reflects a divided country. On November 9th, the House of Representatives passed HR Bill 3996 - The Temporary Tax Relief Act of 2007 [PDF]. I was quite pleasantly surprised by this bill, particularly given how the Republicans invoked the image of Charlie Rangel chairing Ways and Means as a bogeyman to be feared almost as much as the great satan Pelosi herself before the midterms. * The choice that maximizes personal liberty is the best choice. * The policy choice that offers the least amount of necessary government intervention or regulation is the best choice. * The policy choice that provides rational, market-based incentives is the best choice." The bill is an attempt to undo the damage from a particularly onerous and badly implemented bit of past government action. Specifically the Alternative Minimum Tax (AMT), which (in concert with inflation) continues to drive more and more of the American middle class into carrying a higher tax burden than was intended HR 3996 is a reasonable effort to fix problems in the tax code that are hurting a lot of people in the middle class. It allows the majority of taxpayers, including all the middle class (upper, middle, lower) to get off of the automatic annual AMT tax increase escalator and does so in a revenue neutral manner. Republican critics attack the bill on the basis that it imposes a surtax on income above $200,000 in order to meet PAYGO requirements (no new deficit increasing bills), and will be a net tax increase if the Bush tax cuts are permitted to expire on schedule in total. This is an unlikely scenario, and in any case is a red herring argument when applied to this bill. Issues related to extending the Bush Tax cuts should and will be addressed when that legislation is considered, and not be imposed on this bill. "That sort of reaction from many advisers "ignores that this bill would provide overwhelming tax relief to more than 91 million families," said Matthew Beck, spokesman for the Democratic membership of the House Ways and Means Committee. Under Mr. Rangel's proposal, that many families would receive substantial tax relief, Mr. Beck said, while some 1.7 million taxpayers would see an increase in their tax liability. The tax relief would extend to small-business owners, Mr. Beck added. Criticism "also ignores a significant reduction in the corporate-tax rate," which has been advocated by Treasury Secretary Henry Paulson, Mr. Beck said. Corporate-tax rates would be lowered to 30.5%, from the current rate of 35%, but many companies would lose deductions they currently enjoy." The apparent Republican case is that the AMT should be repealed, without any revenue offsets to maintain a tax neutral result. Given the wild out of control spending of the last six years of single party Republican control in Washington, an additional overall tax cut here, (as is seemingly being advocated by the Republicans attacking the bill) would just push more of the burden on to the next generation to pay for it. At some point the piper will be paid in either taxes or inflation, and the Republicans seem only to happy to have the cost of their war and new entitlement programs paid by our children and grandchildren. Is the bill perfect? Far from it. My strong preference would be for a radical overhaul of the tax code, applying as flat a tax as politically feasible with as few exceptions as possible. That option is not in the cards. HR Bill 3996 is incrementally better than what we have now. Sometimes, incremental improvement is as good as a small "l" libertarian can hope for. Sure, it would be great to see all income taxes flattened and lowered, but Rangel is a Democrat after all. It is not like the Republicans even made an effort to get rid of the AMT during their 6 years of big spending, big deficit, big government single party control. In fact, the disingenuous Republican argument ignores the fact that the Republican controlled Congress was only too willing to let AMT creep raise additional revenue to partially fund their earmark and spending explosion in the first six years of the administration. Getting rid of the AMT is an important incremental step in the right direction. Rangel's bill accomplishes this in a fiscally responsible manner, even if the top ten percent must pay a little more to finally put a stake through the heart of this undead bloodsucking tax code vampire. Note to MB - See you in Ouagadougou. Technorati tags: divided government, AMT,2008 election, libertarian, Democrat,Nancy Pelosi,Charlie Rangel,Matthew Beck,3996,tax,Congress.